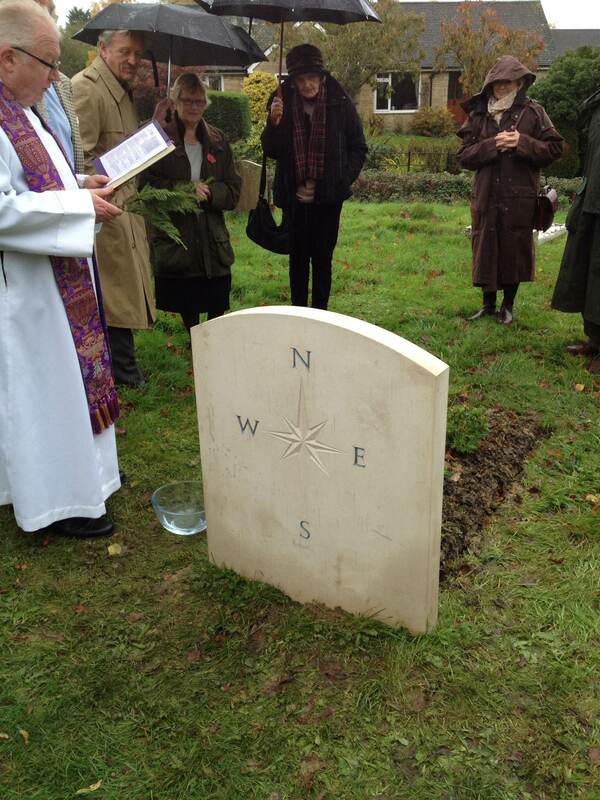 Paddy’s headstone was unveiled during a short service at Dumbleton on 8 November, his name day in Greece, the feast of the Archangel Michael (the Heavenly Brigadier as Paddy called him). It is Portland stone, like Joan’s. Olivia Stewart, one of his executors chose it. The line is from a poem by Cavafy. Among the friends gathered you can see Colin Thubron, Rita Walker (with poppy) who was with Paddy when he died, and Philippa Jellicoe (in black with hat), Bridget Kendall, married to Robert Kendall, Joan’s nephew. Also there were Cressida Connolly and her husband Charles Hudson (he’s the one holding the umbrella over Rev Nicolas Carter (who also toook Paddy’s funeral service), Olivia Stewart, Elizabeth Chatwin, Joey Casey (widow of Michael Casey, who was also Joan’s nephew), Martin Mitchell who was Paddy and Joan’s solicitor, Judith who designed the stone, and Artemis Cooper whose thumb is in the picture! 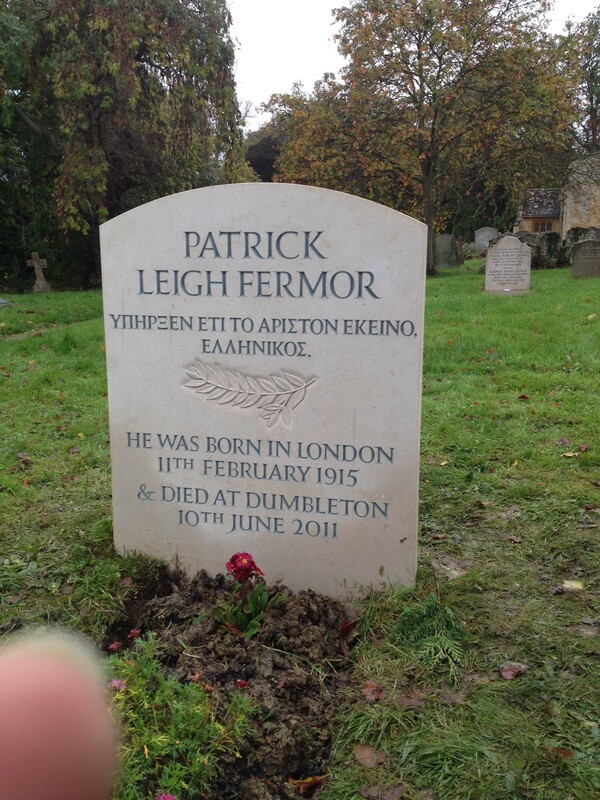 This entry was posted in Paddy's Death and tagged Greece, Patrick Leigh Fermor on November 12, 2013 by proverbs6to10. It is simpler than the learned translators of Cavafy would have you think . The straight sense in the Demotic would be ” He was the best of things , a Greek ” . That isn’t a matter of Passport or Citizenship , but is down to personality , outlook and inclination . It is about the choice you are inclined to make between going home to your comfortable hotel and bed ; – or climbing into the back of your new friend’s pick-up truck , redolent of old goat , to travel up into the hills in bone-jarring discomfort , for a night carousing with joyous strangers , who are celebrating some obscure relative’s child’s baptism by eating spitroast sheep , drinking raki , and ventilating the roof with small arms fire . Goethe summed it up quite well ” You can Sleep , but I must Dance ” . Not quite. Hellenikos is a Hellenist, or an aspiring Greek; not a Greek. The poem’s context makes it plain. What a great human being. Ave atque vale, Paddy. Your writing is truly a “κτῆμα ἐς αἰεί” (a possession forever more) in the Thucydidean phrase (Bk 1.22.4). but may I recommend an alternative version done many years ago by the incomparable translators Keeley & Sherrard, who, in my opinion, captured the meaning of the original Greek better (and in more mellifluous English)? (“He was just, wise, courageous). If only there had been enough space on the stone to hold that first line of Cavafy’s! I’d recognise that thumb anywhere! All my very best to Artemis, Olivia, Joey, Rita and Colin. I am so glad, that is beautiful, especially the olive branch. He would have liked that. Greetings from an Irish fan. 20 pages into the third book and loving it as much as ever! Have paid my respects in Kardamyli,….hope to get to Dumbleton. Lovely news, thank you. We had wondered if there was going to be a headstone, and we’re very glad there is. We shall go and pay our respects (again) next time we’re anywhere nearby.